1.5 Hp Dual Disc Floor Grinder Rental – Edco – 2C-1.5B, is available for rent in Rochester NY, Ithaca NY and the entire Western New York region from the Duke Company. 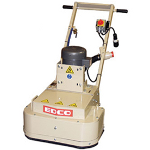 The rental Edco 2C-1.5B dual disc floor grinder available for rent, is electric powered by a 1.5 horsepower, 115/230 V engine. With a 22 inch working width, the machine will grind approximately 400-500 square feet per hour at 1/32″ with EDCO dyma-serts. The machine features a 2″ vacuum and water port. Applications include grinding, floor cleaning for surfaces including warehouse bays, parking areas, shopping malls and manufacturing areas.